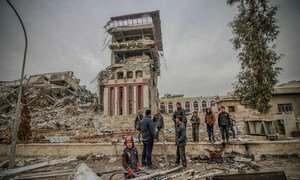 In the wake of more than four years of intense conflict in Iraq to dislodge the terrorist group ISIL, the rehabilitation of the health system and improvements to lifesaving medical services in places like formerly-occupied Mosul, remains a top priority, said the World Health Organization (WHO) on Wednesday. The UN heath agency is working in hard-hit governorates like Ninewa, Anbar, Salah Aldin and Kirkuk - along with local authorities, donors and partners there - to guarantee medical services to the most vulnerable people, coping mainly with emergency recovery needs. WHO delivered 2.5 tons of front-line medicines on Wednesday, to support primary health care centers and mobile medical clinics just in the Ninewa governorate alone. Mosul was liberated by an Iraqi Government-led coalition last July, after ISIL, or Da’esh seized the second-largest city in the country in June 2014. The campaign to expel the terrorists lasted for months, involving street-to-street fighting and the destruction of much of the city. Thousands of civilians died and more than 900,000 were displaced. At the Al Jumhori Hospital, previously known as Al Athba Field Hospital, in West Mosul, doctors are starting to perform surgeries that are life-changing for patients who only recently returned home to reconstruct their city. The facilities built in 2016 by the UN health agency to treat trauma patients during the liberation operation, are now offering specialized health treatments that include laparoscopies, a surgery that uses small incisions in the abdomen or pelvis, with the aid of a camera to examine the organs. “The availability of laparoscopic surgical techniques in our hospital improves medical services in Mosul, and credit must go to the support we have received from the WHO and United States Aid Office of Foreign Disaster Assistance (OFDA),” said the Hospital manager Dr Nashat Ganim Al-Khaiat, in a press release. “I suffered from recurrent cholecystitis which required gallbladder removal which I couldn’t afford to have done privately,” said Nadia, 48, the first patient to receive the new treatment at the hospital. “I had the operation in Al Jumhori Hospital, and now I am recovering quickly. My life is returning to normal,” she added. Nadia had recently returned to Mosul with her family after more than 3 years in a camp for internally displaced people. In September, the International Organization for Migration (IOM) in its Displacement Tracking Matrix (DTM) report, concluded that nearly four million people had managed to return home overall. 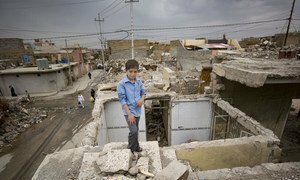 Throughout Mosul some 40,000 homes still need to be renovated and more efforts and resources are needed to meet the growing demand for health care services from millions of returnees and displaced people, who are gradually heading home, hoping to rebuild their lives overall. For the first time in nearly four years, the number of displaced Iraqis has fallen below two million, according to a new report released on Tuesday by the United Nations migration agency.